There are few certainties in life. The sun will rise and set. Taxes will be paid. The current president will tweet inanities. And Cirque du Soleil will not fail to deliver the goods. Back under the big top across McCovey Cove from AT&T Park, the current iteration of the Montreal-based company is back in the Bay Area after wowing spectators with Crystal, their first ice-based show at the SAP Center in San Jose. 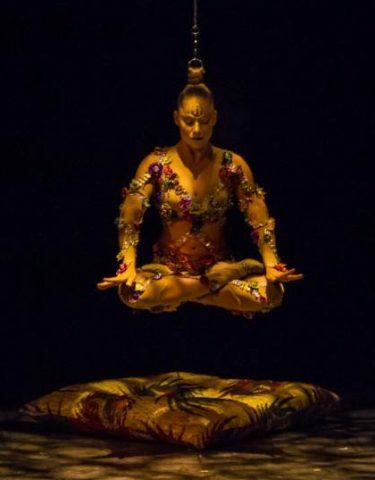 Volta, directed by Jean Guibert, now running through February 3rd at le grand Chapiteau (the Big Tent), shows once again why le Cirque du Soleil is sui generis – one of a kind – and a theatrical experience you must witness. The story behind the spectacle forms a by now familiar trope from the Cirque, the hero’s journey, following the protagonist and gameshow contestant, Waz, through various challenges, all in a dystopic setting and atmosphere, a journey of struggle where he binds with fellow outsiders, leading to his transformation and ultimately liberation, a theatrical bildungsroman. The cast of over thirty performers spellbinds the audience with two hours of dazzling, consummate body performance, integrating more extreme sports performance into the Cirque with BMX, bungee jumpers, trampowall, roller skates and contemporary dance to go along with the more “traditional” forms such as rope skipping, shape diving, acrobatics, aerial straps and even ballet. Without a doubt the showstopper, in the second act piece entitled “Mirage”, is the petite Brazilian Danila Bim’s mesmerizing hair suspension/gymnastics, twirling around the stage, sometimes dancing on it, at times ascending almost to the ceiling lighting rig, suspended by single rope attached to her hair, tightly wrapped in a bun atop her head. It’s spellbinding and gut-wrenching at the same time, for reasons that should be obvious. Too many performers deserve special mention: Joey Arigo as Waz; the roller skater Paola Fraschini with her flowing, technicolor headdress; Swiss Ring performers Thomas Hubener, Loukas Jones, Yan Li, Harry Owen, Max Bennet, and Frederico Giuliani De Olivera; and finally, bungee/ladder performers Laurie Adornato, Kia Eastman, and Charlotte Sumian. All performers shine on the circular stage, in the air, and on various set pieces, ramps, oversized jungle gyms, flexible ladders ascending towards the rafters, the scenography under the direction of Bruce Rodgers, and the brilliant and glitzy costumes by Zaldy Goco, costumier for the likes of Lady Gaga and RuPaul. Some might pass the Cirque off as Vegas-style glam and stunts, but this is to do the troupe a huge disservice by not understanding their roots and heritage. Their skill and commitment are consummate; but what the Cirque does is extend the lineage of body performance of different kinds from its roots in European fairground theatre since the Middle Ages and carry it forward. A particularly French tradition at the famous Foire Saint-Germain in Paris, acrobats, rope-dancers, tumblers, acrobats, charlatans and mountebanks live and breath again through the Cirque du Soleil’s dedication to a theatre that engages the audience’s bodies, hearts and minds. It might be a little pricy, but you can just skip that predictable meal at yet another overpriced restaurant and treat yourself to a feast with the Cirque du Soleil’s Volta instead: its food for the spirit. Playing in San Francisco though to February 2019, then San Jose and San Diego .